With a yawn and a stretch and three pillows strewn across my Motel 6 bed, I awoke. I was dry and comfortable. During the night we rotated clothes and gear into the bathroom and in front of the AC to dry them. The floor was beginning to look like a beach with all the sand and dirt from our tents. We showered, dressed and headed to breakfast. Over eggs and coffee we decided that we would start taking day-trips to various parks/sites from our motel as the rain was going to continue to drench the area for several days. 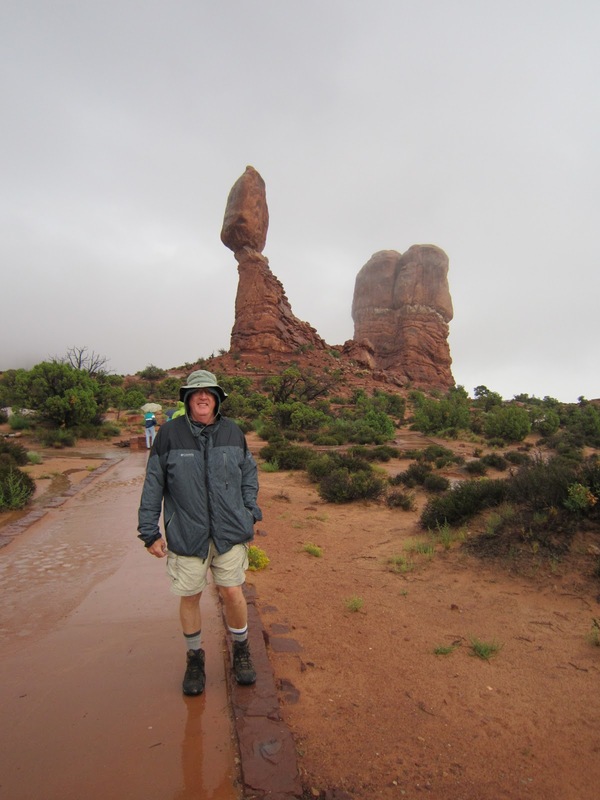 Today’s destination was Arches National Park. 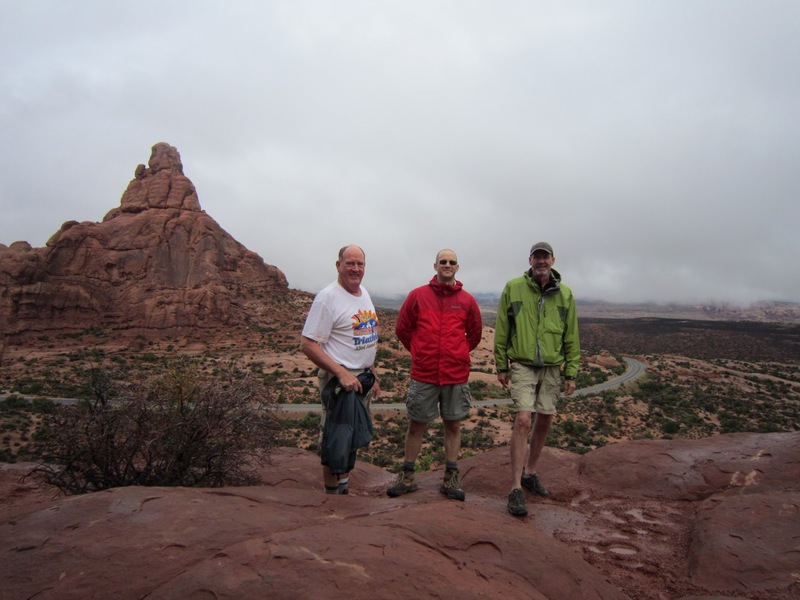 We packed day packs with our gear, grabbed our rain coats, cameras and food and headed out to Arches. It was a thoroughly cloudy day so far; threatening to rain at any moment. We didn’t care though as we understood, since we’d extended our motel room stay, we’d be warm and dry tonight . We knew we were coming back to Arches in a couple of days since we had planned (and still were planning) to camp here in the back country towards the end of the trip. So today, we decided to focus on those other portions of the park that we wouldn’t be experiencing later in the week. 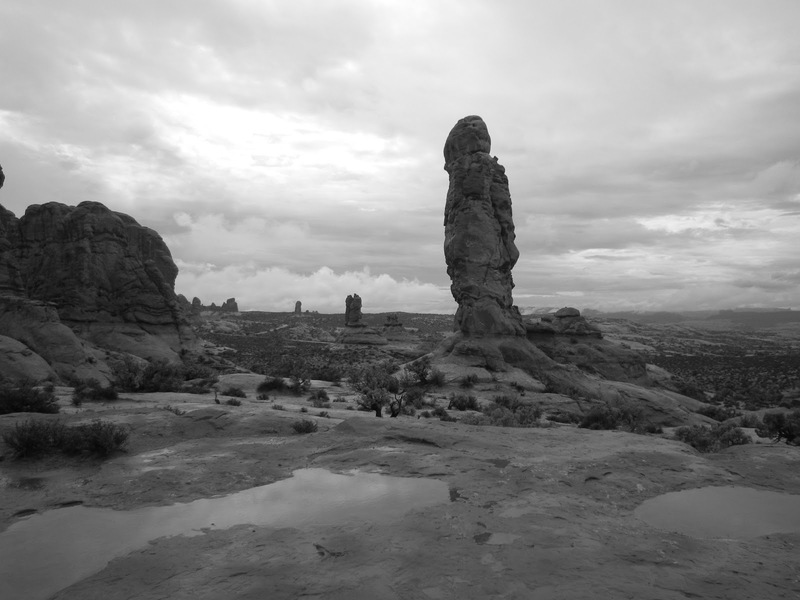 The first site within the park that we stopped at was Balanced Rock (pic to the right). As you can see, it had started raining again but we were determined to see the sights. We walked around the rock and hopped back into the car for the trip to The Windows. When we came upon the Windows, we had low clouds rolling into the area and the rains were strengthening. It started getting crowded in this area as a tour bus had disgorged its camera-laden passengers just before we arrived. 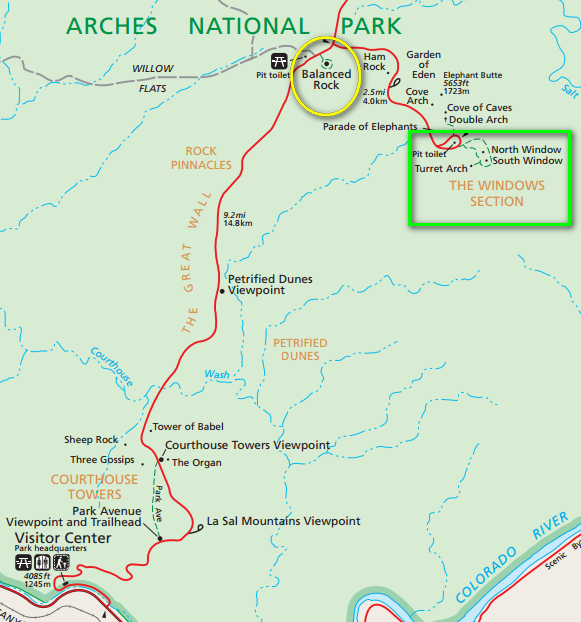 There was a primitive (dirt and rock) trail around the North and South Windows and we decided to take it. The rain was coming continuously now; a steady beating against our rain coats. We saw no one on this trail. Just us, making the most of the day. And then it happened again, a trail angel. A National Park Service park ranger came down the trail from the other direction and stopped to speak with us. We asked what there was to do in the park since it was raining and the low clouds made seeing the sights more challenging. The ranger pondered our question for only a moment. “What you want to do is leave the park” he said. Leave the park? What was he thinking? We’d just got here! 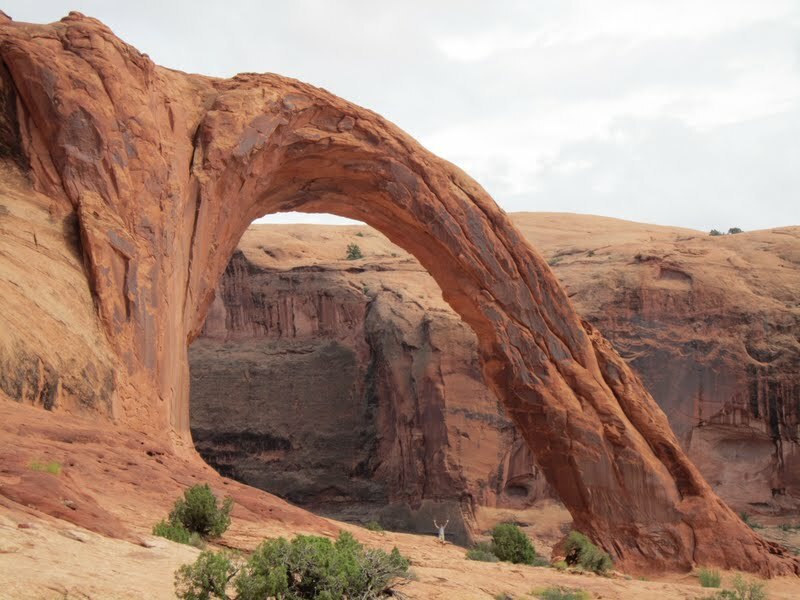 He continued saying that, just south of the park, between the entrance and Moab was route 267. The road followed the Colorado River and if we turned right it would take us to ancient Indian writings known as petroglyphs. A little further down the road would be a place to some dinosaur fossils. Indian writings? Dino fossils? Well, we had great luck with the suggestions from the REI guy, the waiter in Grand Junction and the other park ranger in Needles. We thanked the ranger and bade him goodbye. On the way out of the park, we passed by the Garden of Eden rocks and decided to stop. An interesting thing had happened. You see, once we spoke to the ranger and took his advice, the rains lessened…well…they actually stopped. The clouds started to lift too. Miraculous or just good timing? We lingered at the Garden of Eden rocks for a while as they provided a gorgeous vista of the surrounding area and then we left the park. Clouds continued to clear as we passed Balanced Rock, the visitor center and turned onto route 279. 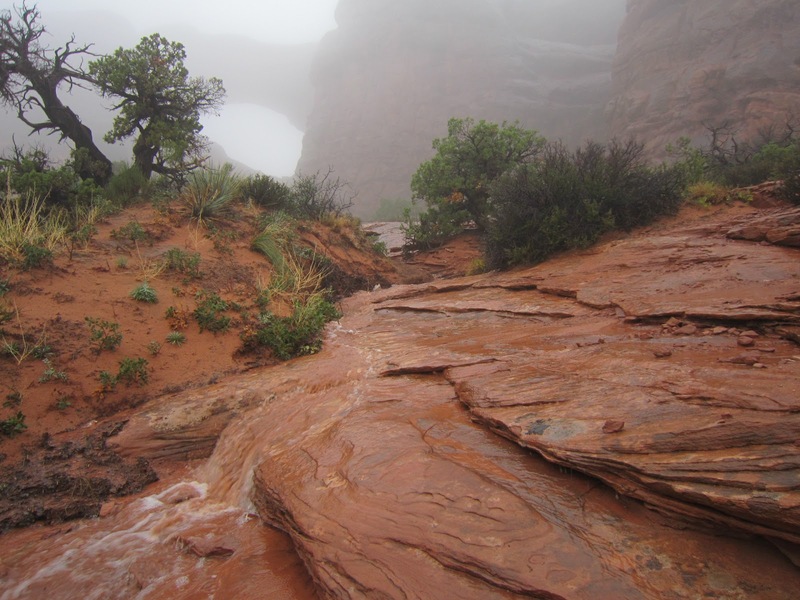 The Colorado river was swollen with rain runoff and ran a dark, dirty brown color. 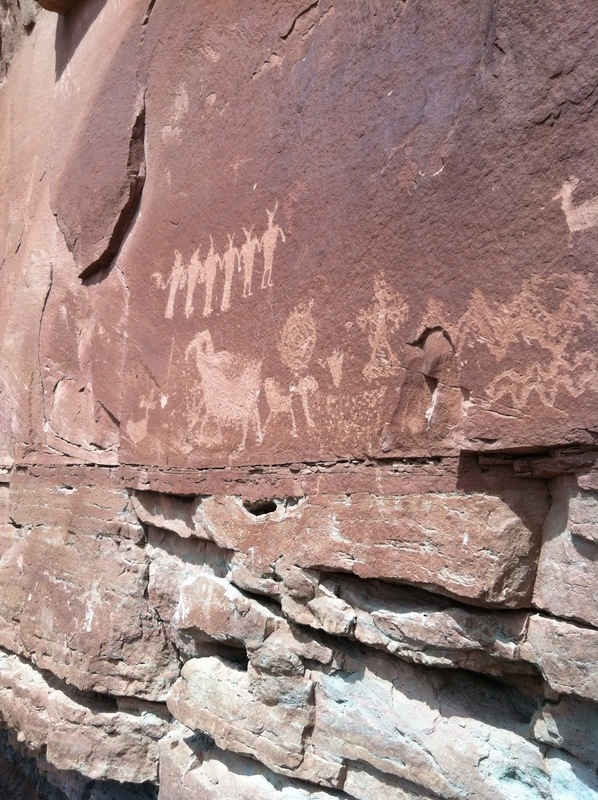 Soon we came to the petroglyphs. They were on the cliff on the side of the road. We just pulled off the side of the road and stood in the middle of the road gazing at these old drawings on the cliff walls. In the upper right portion of the pic on the right are some of the drawings. They were up about 15 feet off the ground. I guess people were taller back then? 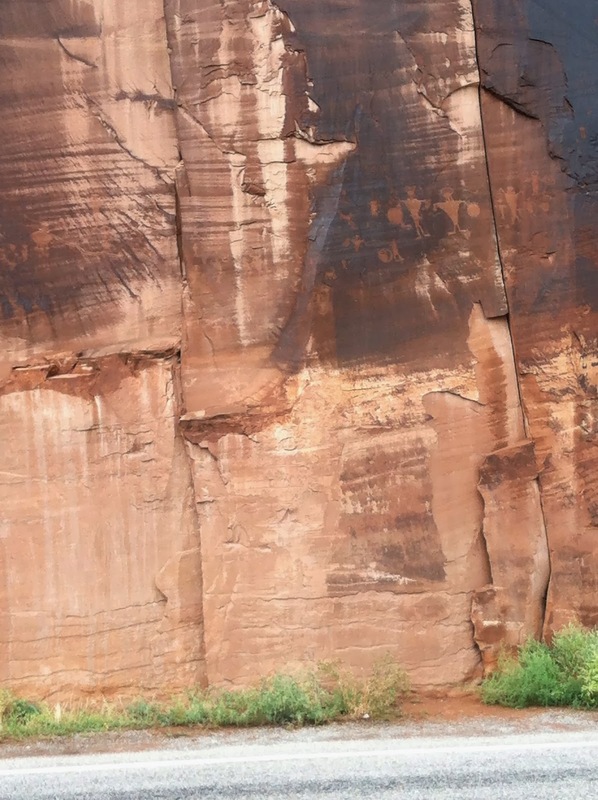 Having seen our fill of old-world graffiti, we continued driving west along 279 and quickly came upon the dinosaur fossils at the Poison Spider Bureau of Land Management (BLM) area. Here is where the sun really started breaking through the clouds and we felt its warmth for the first time. 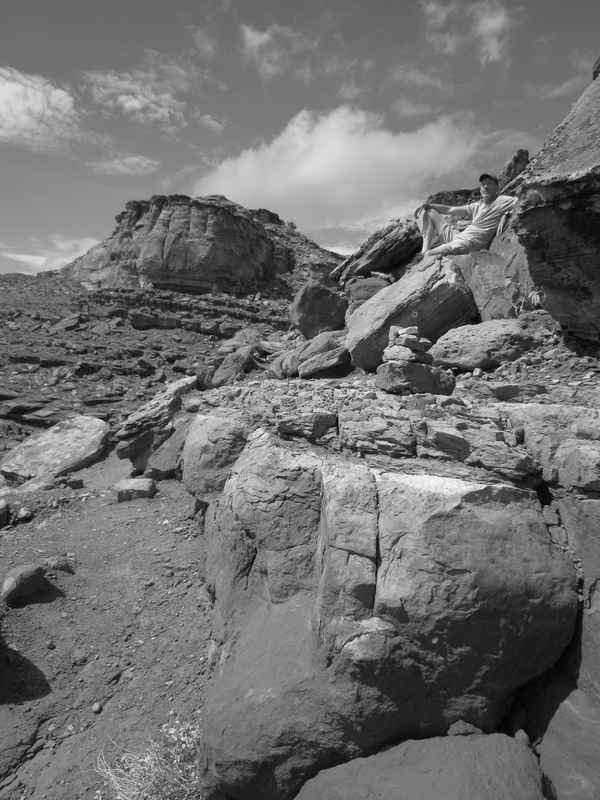 A quick hike up a rocky landscape led us to a large rock with two footprints from dinosaurs (pic on left). We had gorgeous views of the Colorado from our perch on the cliff. Venturing a little higher up the slope, one of our group found a large number of well-drawn petroglyphs. 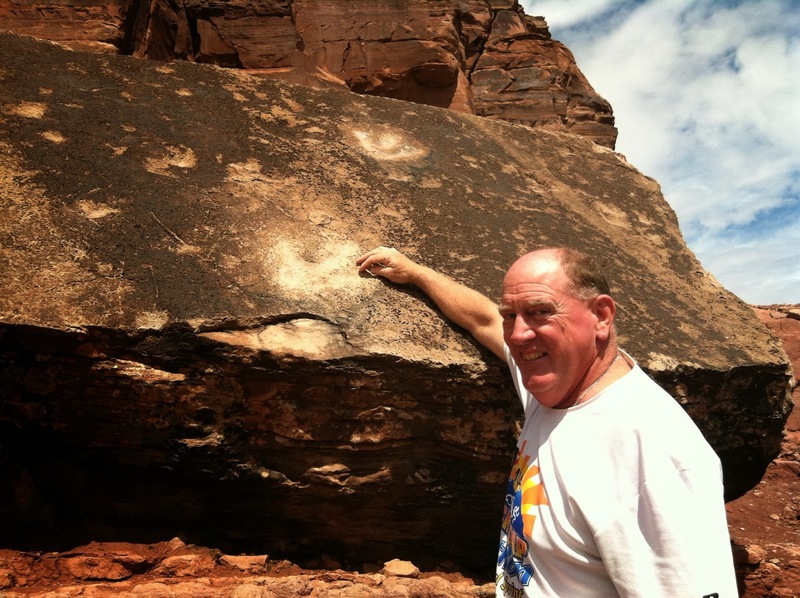 Kind of a neat surprise: go see dino fossils and get petroglyphs for free! In the pic at right there are animals and people among other things. Soaking in the sun felt GREAT! We sat on the rocks and let it wash over us for a good long while. We had nowhere to be. Back at the car we had a decision, it was around 2pm…what else did we want to do? 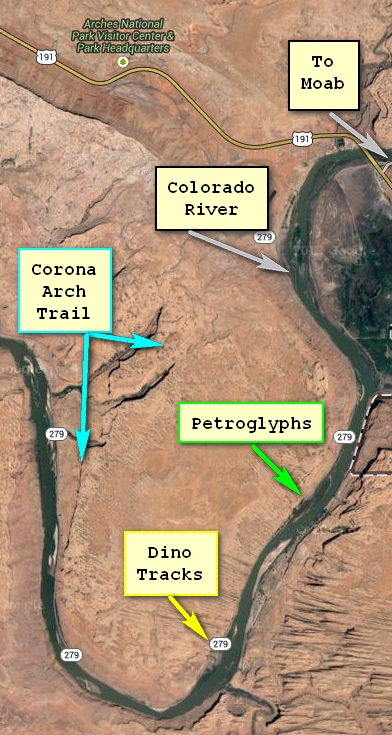 We had a good trail map of the area that indicated there was a short three mile round trip hike to a place called Corona Arch just down to the west on 279. Sounded good to us. As noted above, there is a good web page at http://www.utahredrocks.com/hike_corona.htm that shows the trail and some information about the sites we traveled and saw, respectively. We went from the parking lot at 279 up several hundred feet, across a train track and then onto slick rock. The BLM had placed metal cables to hold onto and even a ladder bolted to the rock in several of the more challenging locations on the trail. 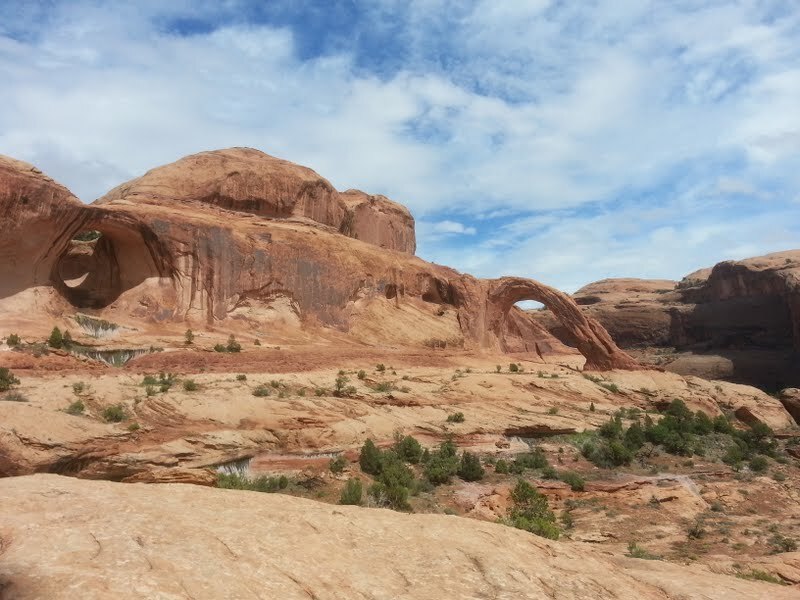 The arches appeared in the distance as we crested a part of the trail. They really were gorgeous in a “geologic” way. 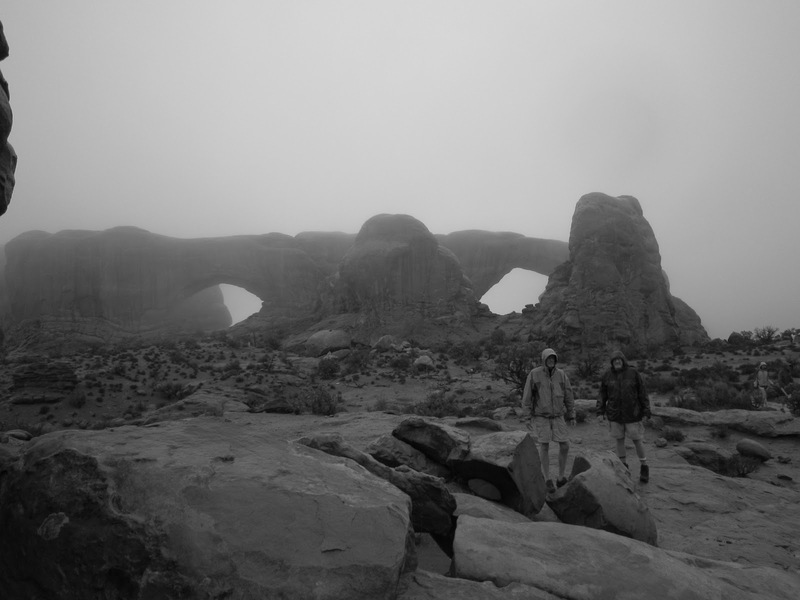 Turned out we were the only people at these arches and the solitude amplified the experience. Some of our group walked right out under Corona (pic on left). Look for the little white spec in the bottom with his arms up. We headed back to Moab feeling good about our day’s events but also feeling a little wimpy about deciding not to sleep outside. It turned out to be a wonderful afternoon and thoughts raced through our heads about our options for sleeping tonight. 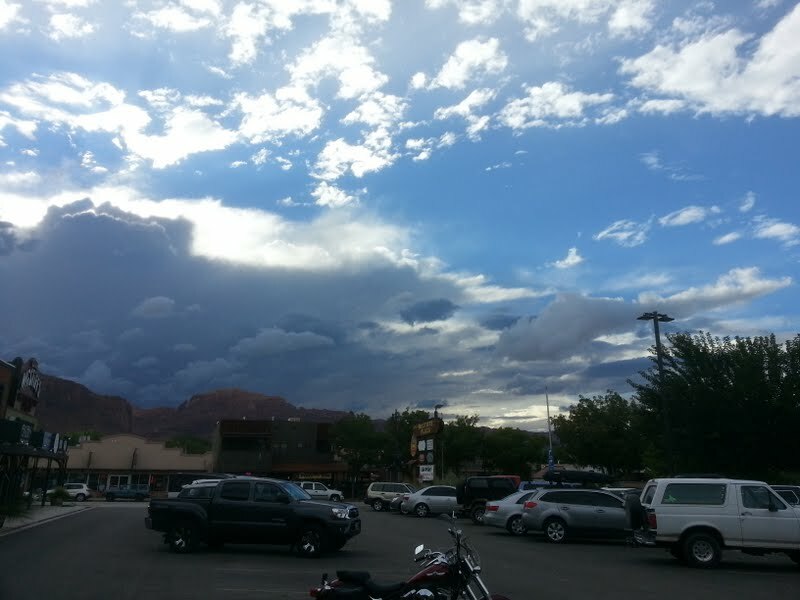 We arrived back in Moab and saw that the weather reports for more heavy storms during the night were probably accurate as there was a gorgeous and ominous cloud bank heading for us (see pic on the right). As we headed in to dinner, we decided to keep the reservation at our motel just one more night. And we slept and awoke…Day five. What do you do when you have shell?